For some, the death early last week of Otto Habsburg-Lothringen, eldest son of the last Emperor of Austria, and so by default the last King of Hungary, marks the final closing of a chapter. To others, and here we should include our Hungarian friends Zoli and Viktor who merrily lunched with us on Saturday, the demise of this nonagenarian in exile in Germany largely went unnoticed. 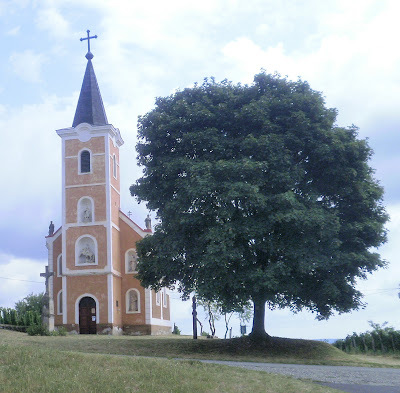 Although, as has been suggested, his heart is to be buried in Hungary, it is very unlikely that the chosen spot will be this wonderful Baroque church which sits in splendid near isolation on a hill of the same name high above the Lake Balaton in the Tapolca Basin. But there is a connection, albeit remote, for this, and the adjacent house of the wine maker, shabby chic surely at its best, both share the now faded colour wash, Habsburg Yellow, which takes its name, and hue, from the original Habsburg flag of 1686. And whilst the Austro-Hungarian Empire might be no more, lonely settlements such as this continue to delight the occasional traveller whose fortune it is to pass this way. As, indeed, it was ours during our recent, and most memorable weekend, spent with the Kondors at their home in nearby Kapolcs. For this is a land which time has almost forgotten and where traditions, centuries old, of a life determined by the seasons and the soil persists. Kings may come, and kings may go, emperors too, but just for now, and for this we are grateful, this most lovely piece of our adopted land remains true to itself. Fascinating as usual, Jane and Lance, and lovely photos for a quiet Sunday afternoon. Thank you so much. Although without the history of Assisi, it is a wonderfully peaceful place and somewhere which, we believe, you would much enjoy. Super lovely photographs, interesting words too. Another light shines for me in Hungary. I heard of his death and as someone who loves history it caught my attention...I was actually surprised there was any royalty left from the Hapsburg linage. The church is glorious, with that wonderful spire, and the surrounding countryside is beautiful. I had no idea that Hungry was so lovely. note....your adopted land is definitely on my wish list of spots to tour. Such gorgeous countryside! Borders may come and go, but the vines abide indeed. I'm an occasional reader of your blog though can't for the life of me remember how I stumbled across it. I'm sure the church is one I visited in the mid nineties - the abiding memory I have is of gilt cherubs and felt quite incongruous in the beautiful sleepy setting overlooking Balaton. Or is my memory embellishing? keep up the delightful work. Oh this is nice. Fine writing, interesting photographs and a bit of history. I'm partial to old fence lines, and this one, depicted in your image, reminds me of my own. Thank you for this peaceful look at your adopted land. I like land in which life is determined by the seasons. I must admit that the news of his demise had not reached our outpost! The Habsburg Yellow house is beautiful. I imagine the interior is just as interesting. Yes, indeed, his death only had passing mention in the Hungarian press although we did see a brief account of his life on the BBC on line. Apparently he renounced all rights to the throne at sometime in the 1960s. All the Habsburg Hungarian possessions in Hungary fell into state ownership long ago when Royal statues were removed from public places. Indeed, you must at some point include Hungary on your travel itinerary although the shores of Lake Balaton are very different from Brighton [or Shoreham!] beach. Everyone has already said it - I love your blog, so different from many; always beautiful and SO interesting. Thank you. It was beside Lake Balaton that Otto Habsburg-Lothringen's father, Charles IV, spent his last night in Hungary before going into exile after a brief reign which ended in 1916. And yes, much of Hungary is very beautiful. Perhaps after Paris your next trip could be Budapest?!! Have Farrow and Ball heard about Hapsburg Yellow I wonder. It is sad to think of the last in a great Royal lineage. We end up with countries run by Politicians, and that doesn't appeal at all. Yes, we are certain that you would find much to interest you in Hungary, both in Budapest and in the countryside. The yellow is a very good colour, and used widely here. The vineyards are, as you may imagine, spectacular particularly those which slope down directly to the shores of Lake Balaton. And the wine is quite good too!! That tree by the Church of St. George looks like it's seen the coming and going of more than one king. I find myself wondering what you look like this morning. I love the explanation of the Hapsburg yellow color wash. I'd like to move right in to the wine maker's house! 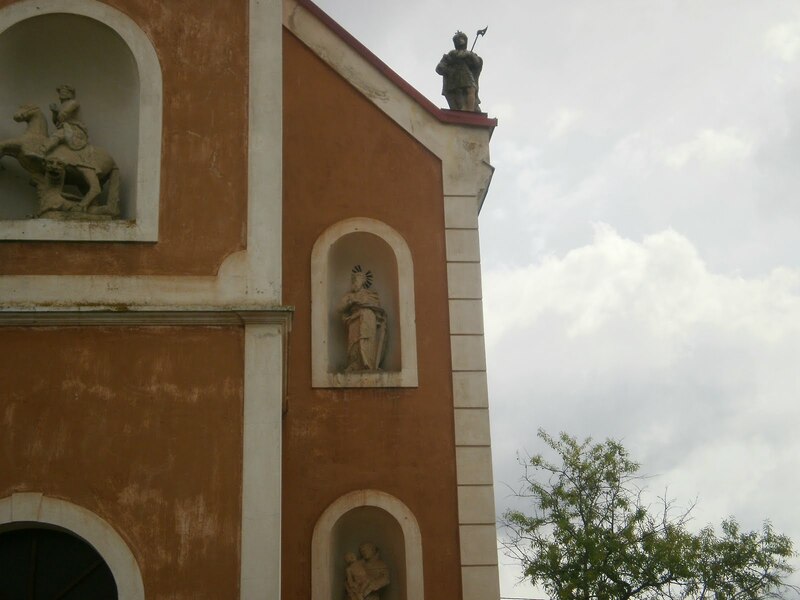 It is quite likely that you visited St. George's, not least for its wonderful situation above Lake Balaton. That said, there are many isolated churches, as you are probably aware, in that region and throughout Hungary. 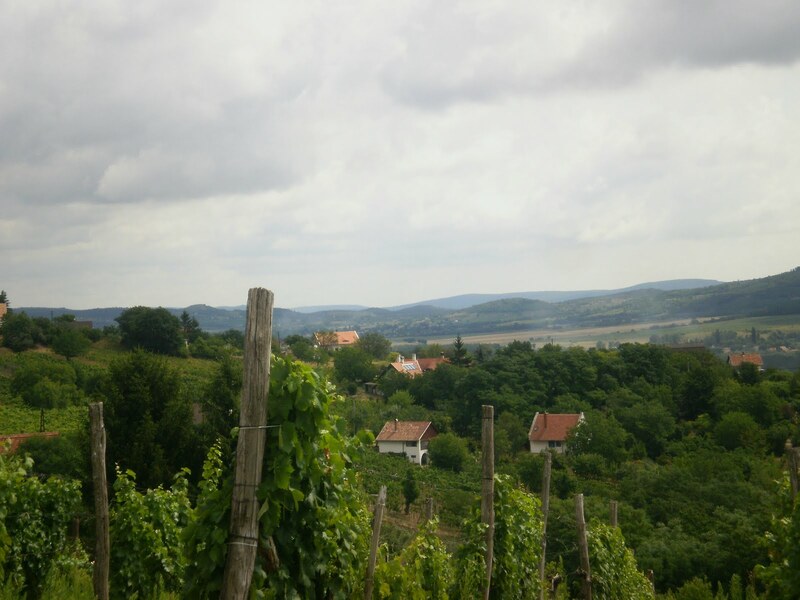 We are delighted that you have enjoyed this post and feel very certain that you would readily appreciate the unspoilt aspects of the Hungarian countryside. That is most kind and generous of you. Like you, we find European history, with its monarchies and republics, endlessly fascinating and, of course, constantly changing. It is to be hoped that perhaps one day you and your husband will be able to visit Hungary. It is, indeed, a lovely country with much of interest to see - including many wine cellars!! Possibly played down in order not to excite unrest among the population! Yes, we should much like to have got inside that particular house which we think, together with its situation, is quite lovely. That is such a very kind and generous thing to say and is very much appreciated. In turn we are always delighted to visit 'A Quiet Corner'. Now that is a most interesting thought. Perhaps we should be in touch with Farrow and Ball first thing in the morning!! We often consider how many monarchies have disappeared in our lifetimes with, most likely, more to go! An ideal spot, we think, for a low key coronation for when we are invited to ascend to the throne of Hungary! We shall leave Austria for someone else. Would you possibly be interested?! We totally agree about that house which, we have to admit, we do rather covet. And the views all around are quite remarkable, possibly stretching as far as Croatia on a clear day. Doubtless he too will soon be no more, as far as Austria and Hungary are concerned, than a page in a history book or a paragraph or two on Wikipedia. But, yes, the whole area is like stepping back in time and completely unspoilt. We love it, as we are sure that you would too. I too had not heard of the death last week of Otto Habsburg-Lothringen, and what a wonderful name. 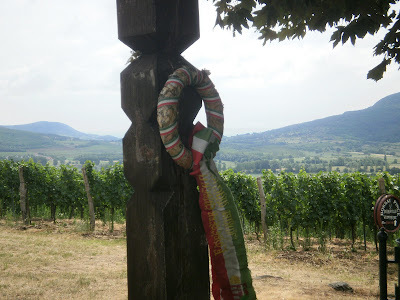 Hungary is moving quickly to the top of my list of countries to visit since following your blog. Most likely he died, which is rather sad, a figure out of his time. But, or so it was said last week, he was surrounded by his family. If ever you do decide to visit Hungary, then be sure to let us know as we should be delighted to point you in whatever direction was of particular interest. I only learned of Otto Habsburg-Lothringen last week when his passing was reported in our newpapers. With great delight a colleague pointed out to anyone who would listen, the fact that this person had been baptised with 17 names (Franz Joseph Otto Robert Maria Anton Karl Max Heinrich Sixtus Xavier Felix Renatus Ludwig Gaetan Pius Ignatius - dare I say - taken from wikipedia as I could never have rememered all 17 names!). Now this is exactly the kind of information which totally fascinates us and of which we were unaware until now. Upon consideration, this is surely one way of sorting out the aristocracy from the rest although Maria does seem a slightly odd choice. Ah, a place that seems untouched by modern-day living. Lovely, but I am wondering if your cell phone works in a place like that. I hope not! An interesting question and one to which we do not know the answer. Like you, we rather hope not! Willingly would we exchange the facility of a mobile phone for such glorious, unspoilt coumtryside. Yes, there is an heir to the Habsburg Empire for there are several children and, most likely, grandchildren. But they have forfeited all rights and claims to the throne. Hungary is now, by its constitution, a republic. Yes, we think that the house would be lovely to have and we are pleased that you spotted the stone carvings close to the roof. When I read about his death I wondered if you would post about it. The photos are beautiful but the first one is fabulous. I would love to be sitting there right now. I just finished reading about Montaigne and how his heart is buried in the St. Michel de Montaigne local church and his body in Burgundy. This has made me ponder if this is possible for us common folk? I rather like this thought. Habsburg yellow, is a cheerful warm colour which blends beautifully with the smoky gray sky and would look good with all skies. 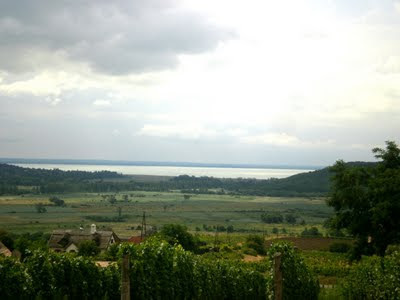 The picture which sent me heart racing was the general view of the region by Lake Balaton, oh to paint this scene en plein aire. Again, thank you sincerely for such a wonderful post. I am hungry(pun) to read more on Montaigne and wonder if his Essays is a good place to start and if so, is there a particular translation you recommend? You are probably one of very few with whom the death registered. Whatever one thinks or feels, it is certainly the end of an era. The countryside is, as you may well imagine, really beautiful and the view from St. George's Hill is spectacular. How very kind of you to write such a detaild post [particularly when, as at the moment, Blogger is so unreliable and written comments, when at the point of being published, vanish for ever and one is left to start all over again] which we were delighted to receive. We imagine that it is possible for anyone to have his or her heart buried anywhere within reason, but, we wonder, who does the actual cutting out? Certainly Hardy's heart is separated from his body but we forget where. Wikipedia?!! Alas, we cannot really recommend any particular translation of Montaigne but are thrilled that you are enjoying his writings. The winemaker's house made me think immediately of the houses in the Cape Town vineyards. I think it's because the gable has a distinctive Cape Dutch look about it. I wonder when it was built and who the architect was. Is it typical of the region? How wonderful to live a life determined by the seasons and the soil, and in such beautiful surroundings. Nice to know that some areas of Europe are still generally unaffected by tower blocks and McDonalds. The house of the winemaker must surely be the title of a novel. We had not previously considered this but, now that you say it, the 'Dutch' gable is very like those houses which you mention in the vineyards of South Africa of which, you will understand, we have only seen pictures. It is quite typical of this region of Hungary and dates, we should guess, from the late C18 early C19. You are, of course so right, for there are now fewer and fewer places to go where the dreaded, in our view, McDonald's sign does not rear up out of the landscape. As for tower blocks, we fear that they do surround many of the larger towns, all mostly dating from the Communist years. 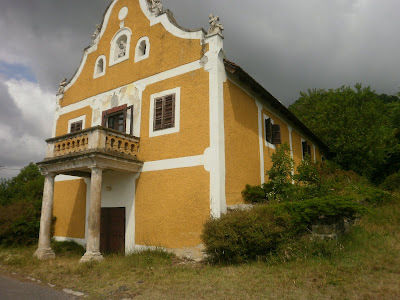 So interesting to know the origin of Hapsburg (the way I've seen it spelled in the U.S.) yellow, and what a beautiful house and tempting cellar. As always, thank you for making my day more interesting. Your comments are always so very, very generous and for that alone they are so much appreciated. But, in addition, you never fail to notice the smallest of details, the mark of a truly professional eye!! I have never been in a wine cellar. Is it like Oddbins, only dustier? Something of the kind. But think Oddbins without the lights, underground, a plethora of spiders, no cash and wrap, but much, much cheaper! Otherwise pretty well the same. As we should love to be hearing the sound of those waves!! But if ever Europe beckons, do try to include Hungary for it is the most fascinating of countries. Worth serious consideration. We are fairly sure that there are 'perks' with the job beyond our wildest imaginations. And what fun as we could be neighbours - even crown share! It is really the wonderful countryside which 'makes' the photographs, far more than any expertise we have with a camera. Thank you so much, Linda, as always. The Habsburg Yellow is a really good colour, especially when allowed to weather, as happens most often in Hungary. And yes, the house does, now thinking about it, look very Dutch Colonial. "a life determined by the seasons and the soil persists.."
Imagine a life that is determine by the earth, the weather, the sky. How connected you would feel to what was happening around you, and how unimportant the things that occupy our modern lives would seem! Again, this is a beautiful journey you are on. I feel so grateful to be a part of it! The Church of St. George that you showed might look a bit tatty now, but the architecture is still fascinating. I would love to know what Hungarians call this style of church building. Perhaps it is gothic with some sort of Scandinavian horizontals and Hungarian colours. We do so agree about the colour which is used widely, and to great effect, throughout Hungary. To have a connection with the land is something which somehow, unlike previous generations, has been more or less lost to our own. It is always reassuring to find instances of it in modern day life. Unfortunately we are unable to help on this. It certainly seems to derive from a number of different styles with, as has been said, some indication of Dutch Colonial. Not uncommon here. Interesting. It is extraordinary that this once powerful dynasty ended rather abruptly after the war. But then so too did the German's after 1918. I was surprised to see the descendants of the Kaiser at the wedding in Monaco - styled HIRH & HRH, (Germany & Prussia). The success for survival is of course adaptation - a lesson well-learned by the House of Windsor. When there are just too many bits of information on the web and too many diaries, I'm so grateful to read another of your considered and entertaining posts. You've bothered enough to tell a STORY, woven from various sources, and that is what is engaging. Although I had not heard or read about the King with 17 names, who never was, I do find the disconnectedness of European royalty very interesting. Because of you I am becoming more and more fascinated by Hungary, which seems more and more to be an unsung jewel of a place to visit, nevermind live! When I look at many of the pictures you post of the countryside, the topography often reminds me of the northwest corner of Connecticut where I grew up -- unfortunately, no Hapsburg/Hapbsburg yellow there, however! Hi Jane and Lance - what lovely countryside. I wasn't aware of the passing of the last in line to the Hungarian throne so an interesting fact. The dissolution of empires and dynasties throughout history is, as you say, a constant source of fascination. And yes, so too is the investigation into why some succeed where others fail. Yes, we know exactly what you mean about there being something rather lovely about isolated churches just rising out of the landscape, especially if they are still used and have not fallen into disrepair. Such a kind and generous comment, Faisal, for which many thanks indeed. It certainly is a fascination for us the way in which so many things in life overlap and interconnect and we never cease to be amazed at how much we have yet to learn about Hungary, its people and its history. Whilst other countries seem only too aware of how important tourism is to their economies and, hence, the need for advertising, the Hungarian Tourist Board is shamefully inadequate in this respect. We are so pleased that you are enjoying knowing more about this most interesting and richly varied country and, who knows, perhaps you may visit us one day? It intrigues us that although often in England we hear little in the media about Central Europe, in Budapest there is always a keen interest in both local and world affairs. Even the free newspapers can be relied upon for their comprehensive coverage of current affairs. Sadly, our experience of keeping chicken was not altogether a happy one. They looked very stylish [Black Rocks] but they were always falling out with each other and eventually had to be returned to the farm from which they came. However, the eggs were wonderful and have never been equalled since. Otto Habsburg's death won't have passed unremarked upon in Germany and Austria. They take their royalty and princes still quite seriously, although they would certainly not want them back. I am really quite envious of you two and your lifestyle. My heart aches for old Europe; although I left decades ago I do so miss the attention to polite detail, the emphasis on appearances and appearance and the knowledge that the past is with us at all times. The UK is fine, I am settled and contented in my rural backwater, but where oh where are the wide, endless skies of the European landmass. Oh dear, I am rather giving myself away here. 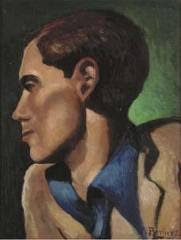 I read Otto's obituary in the NY Times with interest. He sounded to be an unassuming man, but one who lived a commendable life of service to his (adopted) country. The photographs of the church and related house are quite lovely, and the colors magical. It is interesting to observe how the passage of time plays out, isn't it? How I love traveling the world through your eyes and sensibilities. Had no idea about the end of the Hapsburg line, but then here we are in America where people often refer to Paris Hilton and Kim Kardashian as royalty, so you know, our standards are a bit, um, tarnished. The church is lovely - we still have some like it here in the countryside though in the city here there is one so big people call it Six Flags over Jesus (Six Flag being an amusement park). So again, you can understand why your blog is a welcome change. One of the things we particularly like about being in Budapest is that one feels part of a greater Europe unlike in the UK which always seems to us rather insular in both position and outlook. But, you do live in the most wonderful countryside and that is compensation indeed. Yes, we would agree with your description with what we have read about the man. People who give so much to public service are a rarity these days and yet their contributions can be so valuable to so many walks of life. How we laughed about your description of American royalty. We should like to be able to say that we had heard of neither of the 'celebrities' which you mentioned but, sadly, Paris Hilton is known to us, not least through the hotel chain. However, we have delighted in the fact that we have no idea who KK is......being without a television for 30 years might, we suspect, have something to do with this!! You are (due to this post) responsible for me sitting for far too long "googling" the origin of some of my favourite paint colours sitting in my paintbox.... I have had a wonderful time and it beat doing the ironing hands down! What a wonderful way to spend time. Paint colours have such fascinating names and their origins are indeed beguiling. But then, almost anything beats the ironing!! Thank you so much for commenting. We do so hope that you will visit us again. Thank you for your kind words. The countryside is really wonderful, if only our photographs could do it justice. Neighbors and crown share ... sounds unimaginably lovely! Thank you. It really is a most wonderful part of Hungary and completely unspoilt. I enjoyed these postcards and history from the lake Balaton area and your weekend with friends. The winemaker's house is utterly charming...what will become of this lovely place? You've written movingly of the passing of Otto Habsburg, thank you for making us aware of this quiet unassuming man. We are so pleased that you have enjoyed this little glimpse of the Hungarian countryside which is, as you may readily appreciate, most attractive indeed. The death of the last of the Habsburgs seems to have passed relatively unnoticed in the world at large. How intriguing all of this sounds. But we are not in the least bit surprised as we know from your posts what a wonderful collection of antiques you have in the Old Historic House. Yellow is my favorite color on a house. Love the winemaker's place and the church. The scenery is breathtaking and story intriguing. Yes, we agree about the yellow. When we had a garden we had a tower built which was painted a very similar shade of yellow. We loved it and it did serve as a beacon in the surrounding countryside. Shabby chic indeed! Love the photos thank you for posting. This was a very educational post for me. I'm learning so much! Thank you. I also catching up on your other posts too, as they also look very interesting and informative. We are so plesed that you are enjoying the posts and very much appreciate your saying so. We too hope that your day is going well! Lovely, thought-provoking post. I followed you from a comment you left for Richard of My Old Historic House, and I'm so pleased that I did. I spent time today working backward through all your posts and felt a sense of disappointment when I reached the end (I suppose that would technically be the beginning). Thank you for sharing your fascinating thoughts, images, and interests. Thank you so very much for your kind and generous comment. We are delighted that you have found things of interest in what we have written and are so pleased to welcome you as a Follower. We have read your own blog with much interest and look forward to returning often. This lovely area reminds me, hauntingly, of Appalachia where Dave and I live at Thistle Cove Farm. A house of buttery yellow stands as sanctuary of beauty in an already beautiful countryside. Shortly, I'll travel, again, through Hungary; it's one of my favorite countries. Hello Jane and Lance - What a beautiful countryside; I can see why you've been drawn to Hungary! And the church of St. George is charming. It reminds me of an illustration from a book of childhood fairy tales. Such a wonderful post! Although I am not a monarchist by any stretch, something about monarchies fascinates me entirely. I think it has to do with the luxury of having a very clear picture of who your forebears were. I did, however, become quite hungry reading the post (not Hungary, ha! I just noticed that...) because I thought you had written "Tapioca Basin"! What a lovely story of historical treasure to be found on a remote journey. The architecture seems to have such spirit in itself, almost tangible, it is moving to me. A wonderfully rich heritage you have there in Hungary. 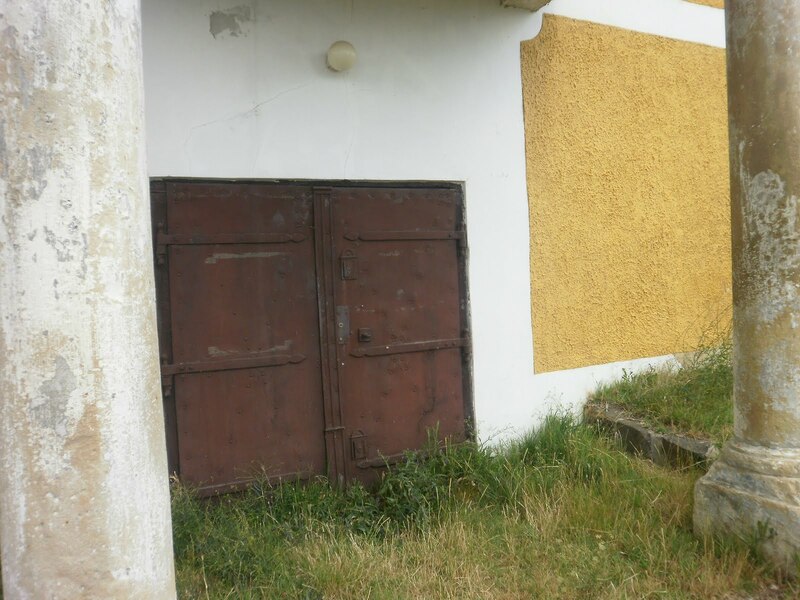 I expect to be visiting Hungary on a business trip in August and would be most grateful if you could name one or two "must see" venues in addition to the Terror House museum that you featured in a June blog post. I will be working in Budapest and could possibly take the weekend to see some of the countryside as well. If you don't have time to respond I totally understand, just want to put the question out there as I enjoy your personal experiences here on your blog and respect your opinion. We have always imagined from your title image that you live in the most glorious countryside and we are certain that Thistle Cove Farm is as lovely as anywhere. Here the yellow is almost a recurring theme or motif. If you find yourself at any time travelling in Europe, then do, please, let us know. Indeed, St. George's Church does have the appearance of having been drawn from a picture book, as in fact do many of the cottages to be found in this particular region. As yet, completely unspoilt and unpopulated. Like you, we should not count ourselves as monarchists [preferring to live in a democratic republic] but, where history is concerned, there is something quite fascinating about these former dynasties which made such a mark on the world. It is, as you so rightly say, the rich heritage of Hungary, so steeped in history, that makes it such a very fascinating country, parts of which are extraordinarily beautiful. How wonderful that you will be coming to Hungary on a business trip in August. Of course we should be delighted to make some suggestions for you and will email you separately. Thank you for such a kind comment. Much of the Hungarian countryside remains completely unspoilt and it is still possible to find villages where little has significantly changed for many, many years. And there are, as you say, some lovely buildings. What an interesting story and such beautiful homes, especially the yellow house. We do agree about the yellow house which, although of course we have not been inside, we feel that we should love to live in. Superb all year round views. Yes, is the answer to your question and we are delighted that you have found the Encyclopedia to have been of some use. If you were to Google our name, then most likely all of our garden books would come up, some ten or so. For over twenty-five years we made a garden in Herefordshire which, in that time, gained something of a National reputation. It was featured often in magazines and appeared on television at least four times [BBC2, ITV and Channel Four]. Yes, it is indeed a most wonderful landscape and although very different from the English countryside, we have really come to love it. But, Claudia, how wonderful to have spent time in that area north of Lake Como. There the scenery is so very picturesque and dramatic - somewhere which we feel we could so happily live. But to move again...possibly not! Thank you so much for this. It is entirely mutual! Thanks first for being faithful to me! I want to go worship in that baroque church right this minute. How precious! We do agree that the church is lovely, as is the superb countryside in which it is situated. And we do count ourselves as being very fortunate indeed. We so much enjoy your lively and spirited blog so any thanks is, most certainly, on our part! Reading your post today meant another history lesson for me. The country side looks beautiful and makes me want to visit this part of the world. I agree with many of your other readers, the color yellow is indeed beautiful. As always, I have enjoyed your post and the commentary. The countryside reminds me a great deal of Napa, California. Beautiful photos. I am more for good wine and company too, that for the emperors of this world. This is such a very kind thing to say but we do hope that the 'history' element does not become too tedious!!. Yes, the yellow is wonderful and is to be seen, in varying degrees of brighter and darker shades, all over the country [which is, for the most part, very beautiful]. A very warm welcome and thank you so much for becoming a Follower. It is much appreciated. California is yet another place we should so like to visit - in fact we could in all probability spend months in the USA without seeing all that we should wish. Now we shall certainly drink to that - as we hope that you will, or are, too!! My real name is the feminine of Lothringen. Oh these photographs are so beautiful, what took you to Budapest? Hubs and I are seriously considering saving up for a trip on the Orient Express to Budapest - this will require satin dresses , fox furs and silver cigarette holders of course. In order to show due respect, we donned black armbands before writing this reply. Oh yes, the Orient Express, we should be thrilled if you should arrive in such style. You would, of course, recognise us on the platform, wearing tiaras and carnations in buttonholes as well just in case we did not stand out! Ah, how sad to see an Empire, once a power revered, dwindle to this. We must have hope that rememberance will keep them alive. A wonderful post, thank you for the inspiration. Thank you for this very kind comment. Yes, his death does mark the end of an era and does also, we feel, put the final seal on the Austro-Hungarian Empire. Such is life and the passage of time. I am delighted you found me, as I now, too, have another excellent blog to follow. Your adventures intrigue me and I shall follow you along the way. Maybe our paths will meet! Another fascinating and informative post! The colour of the church is wonderfully rich, and all the more so now that I know its origin. The countryside of Hungary is so beautiful. I would love to visit it someday. Thank you for posting these photos! Having my first, but certainly, not my last visit with you Jane and Lance, I am in awe at the history and knowledge expressed through this wonderful part of the world, your world. My sympathy for the end of an era with the loss of a King. How very interesting. The architecture, lovely, strong, structures that surround your Hungary. I will be most honored to visit again. Thank you for stopping by my minute' piece of the world. We are delighted of course to welcome you, Dianne. Landlocked Hungary will, most certainly, be a change from bobbing about on the Bristol Channel, a thought which greatly intrigues us. We shall much look forward to our being in touch. We do so agree about the colour and love it especially when it is slightly distressed as on St. George's Church. We should love to think that perhaps one day you will be able to visit Hungary. We shall certainly be here to welcome you! Thank you so much for such a very generous comment and for becoming one of our Followers. Both are very much appreciated and we too are delighted to have discovered 'Dars Stuffings' to which we look forward to returning. As for the death of the last claimant to the Habsburg throne, it is indeed the end of an era. The scenery looks absolutely stunning and not a pylon in sight! Yes, it is and, you are right, no pylons to spoil the view. Very few people too so, in our book, that makes it even better. We are thrilled to welcome you as a Follower and are so enjoying your most original and witty blog. Interesting photos from Hungary together with your usual interesting writings... Thanks, Jane and Lance, for introducing me a country which I don't have a chance to go and see. We are so pleased that you have found the post of interest. Blogging, we agree, is such a wonderful way to see places that one may never see in real life. Thank you for your most generous comment. What a gorgeous place. Love the yellow church. It is most certinly one of the very pretty parts of Hungary and the church is, as you say, lovely in that rather washed out yellow. Beautiful countryside! Only nature has witnessed the fleeting prosperity of each king. I don’t know the details but the name Hapsburg rings a bell. I’ve remembered when I travelled to Germany and Austria. I was so fascinated by especially European landscape. In contrast to the island country of mine, people migrated and culture merged in the Europe, still each country seems to have its own color, which I think is interesting. Thanks for visiting my blog and leaving a nice comment. I’ll be glad if I could transmit the charms of my country and learn more about UK and Hungary as well. Have happy days ahead, Jane and Lance. The point which you make here about the differences to be found between European culture and history and that of your own country is most interesting. And it these differences, and an awareness of them, which makes travel so very rewarding. Related to this, we love your description of Nature alone witnessing 'the fleeting prosperity of each king'. We are delighted to welcome you as a Follower of our blog and will much look forward to the European-Japanese link!! More beautiful photos from you and I continue to learn so much (which isn't difficult since I knew nothing before following your blog). Thansk! Thank you so much. We are pleased that you enjoy the posts. And now, unless we are mistaken, you have reached Europe, albeit not yet mainland!! Truly beautiful....in every sense! Oh, to experience such a place..... Thank you for sharing! Now, for a jet setter like you....! When do we anticipate your return from foreign shores? We are,of course, delighted that you too should find this landscape attractive with its vineyards, scattered villages, and isolated churches. Thank you. So different of course from our Australian landscape of drab olives, khakis and dusty greens. Whenever I visit Europe (and more specifically Britain) in summer I keep uttering - "Oh, it's like a garden, like a park!" about the countryside! The Hungarian countryside is indeed incredibly green this year so far, although whether this will last with the scorching temperatures we are experiencing at present we doubt! Britain, does as you say, have the perfect climate for gardening, although one has to like the rain!! Thank you for your comment and for becoming a Follower, both of which we appreciate very much. We are delighted to return the compliment on both of your blogs. Always a lesson in history for me when I visit you! Beautiful pictures also, the picture of the house on St. George's Hill is beautiful with that light that looks like a rain storm is brewing against the bright mustard yellow of the facade. Thanks for sharing! Completely enchanting story - I do feel like I have travelled to the place, as you say, which time almost forgot. But there is much sadness in your tale too - or perhaps that should be wistfulness instead. Yes, that is a better word. History is such an important element to the way in which perceive landscapes, don't you find? Impossible to separate the beauty of this place from its past. In fact you are absolutely right, Tina, as on that particular day we kept running into very heavy rain storms. But the darkening clouds do, certainly, make for a more dramatic picture. And we didn't actually get wet! What you say about history to some extent fashioning the landscape, Virginia, is most interesting and, we feel, very true. The two are, when thought about, totally interconnected. And what a wonderfully apt description 'wistful' is. Thank you for that! It is, we feel, always interesting to learn about places, and ways of life, which are new or unfamiliar to one. We think this so much when we are reading your own blog. What beautiful countryside, green and lush and the red roofed houses seem to sit in it so well. The church and house are both wonderful buildings, I could look around places like those all day long. I wish I had made more effort to visit Hungary when I lived in Austria. I hope I might rectify that mistake one day. One thing that seemed strange to me at the time was that in Austria, even in the summer, stock was kept inside. I never saw grazing animals and from your photos, maybe it is the same in Hungary? Have a lovely weekend, apparently ours is going to be typically wet. How interesting that you once lived in Austria. We do so hope that you might return to Hungary one day for a closer look. We are sure that you would notice many differences from Austria. And yes, we have often remarked that cattle are kept indoors far more than in England and very few sheep are kept at all. Lamb is not widely available in butchers' shops. Made me think of this. Sorry. What a fun link which a) we are very impressed at your ability to include a link in a comment and b)seems strangely appropriate, we agree!! Such a pity that the vocalist did not understand Hungarian pronunciation...an 's' is always pronounced 'sh'!! In our view, there was not a Count Dracula to beat him!!!! Perhaps I'll never get a chance to visit these places. That's why I'm grateful for these photos. For me, the most valuable aspect is your attitude towards them. We say this ourselves about the many wonderful places that are shown all over the Blogosphere which we fear that we shall never see in person. How very kind of you to say that what we write is of interest.We are very happy to share with you this corner of the world that we think is generally overlooked. The land survives beyond every political, social, tribal system we impose on it. North American First Nations people have the right concept about not really owning the land, even though we think we do. But still, the end of so many things is sad,as this is. I never knew that was the origin of Habsburg yellow. Interesting post. I am glad that I did not miss out on this entirely! What a wonderful post. There are emotions clinging to the land. How very beautiful and thank you for taking us there. We totally agree about people not owning the land. They just, in our view, are guardians for the next generation,hopefully leaving it in better heart than they found it. However, as you say, the coming to an end of a significant era always is tinged with sadness. We are so pleased that you found things of interest in what we write. Yes, Habsburg yellow is such a fantastic colour. We love it! How beautifully put..."There are emotions still clinging to the land".....and so true, one can almost feel them when one is walking around there. It is an incredibly beautiful and unspoilt spot. Thank you for your kind words. We are pleased that you find the book a useful reference. Unlike perhaps other such books, it was all based on practical experience which we are always happy to share. There are words which are customarily used for particular events - sportsmen, for example, always 'crash out' of competitions. The old European monarchies were 'swept away' by the cataclysm of the First World War, and the events it provoked. Not before time, some would say, considering how many millions died in this most pointless of European wars fought for the absurd territorial and dynastic ambitions of a small group of largely related royal families. I've promised myself not to start in on royalty again so I'm trying hard to keep it factual. The recent bout of House of Windsor (or should I say Saxe-Coburg-Gotha) worship made me ashamed to be English. The British royal family and its advisors, in fact, felt threatened in the aftermath of WWI by a rise in republicanism and moved to make the monarchy more inclusive, particularly of the working class. It was a successful transformation. Socialist objections to the monarchy were mollified by the politic attitude of George V to the Labour movement, and its first government under Ramsay Macdonald. The British monarchy was pretty astute in saving itself from going the way of the Austro-Hungarian, German, and Russian empires. Wow, it looks lovely around there. I don't know if it is just me, but some of the architecture has echoes of the Palladian style found at West Wycombe Park. Certainly the ochre colour wash at West Wycombe is not unlike the Habsburg yellow and yes, we do see what you mean about the Palladian echoes, albeit on a much more modest scale. Many apologies for the delay in responding but we have just retrieved your comment from spam! Thank you for your kind comment. We love the distressed look. Ah! Who knew that St. George had a church! Macabry is Very Pleased. Lovely photo accompaniment, too! We are pleased to have pleased Macabry and share in his pleasure. Thank you so much for your comment and we shall very much hope to detect a paw print here again in the future. Good Morning from Ireland. I have time this morning to visit Lake Balaton with you both, before I dash off to college to work on my sequential drawing of cellar equipment! Beer cellar that is, not wine! My favourite sentence is this one "For this is a land which time has almost forgotten and where traditions, centuries old, of a life determined by the seasons and the soil persists." Thank you so much for this exceedingly generous and kind comment. In return we do hope that you have a really enjoyable morning in college tackling that beer cellar! We have, as it happens, spent much time reading back through the posts of 'Dolly's Art of Daydreaming' - at least all those which remain. This is not flattery, nor anything we feel we are obliged to say. They are wonderful. Beautifully written, from a personal standpoint, full of interest, variety and with great touches of humour. We found them to be a delight to read and an insight into so many different places, most of which, to our shame, we know little about. This is a plea from the heart. Please, restart the blog!! This is not the last on the subject.We shall pester by email. And we have a name! !